A lot of people love cycling but don’t have enough facilities or space in their vicinity to do it. In those cases, indoor cycles are what make complete sense. It is a great exercising tool as well as you can continue your habit of cycling right in your home. 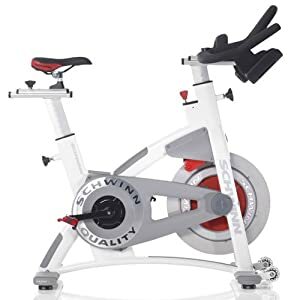 Schwinn A.C Performance plus Indoor Cycle is probably one of the best ones you can get your hands on. You would definitely want to know some of the best features of the Schwinn Spin Bike. The handlebars are ergonomically designed and they are completely adjustable. They have implemented a new technology called ErgoLoop which gives you better accessibility over the handles. The pedals are one of the most important parts in a cycle and they are really comfortable. It has a double link with SPD and is also triple link compatible which ones you can get a triple link too. The seats are completely adjustable too so you can sit comfortably in the cycle. There are various positions like up, down, forward and backward which you can adjust your seat to. It has a nice resistance mechanism with magnetic brake chain drive system which uses forged steel crank for the braking system. It has a flywheel of 37 lbs perimeter weighted disc which provides additional resistance while riding the cycle. It helps in exercising well. There are two riding options available which is chain drive and carbon blue belt drive. This is great for people who want options in their riding style. Although there are no computers in the cycle but they are completely compatible with MPower consoles which are sold separately. They are completely worth it if you depend upon a computer for your workout. The front wheels of the cycle provide easy transport in case you want to move the cycle from one place to another. The color of the cycle is pearl white which looks quite decent in all the environments. If you are looking for an indoor cycle for exercising, this is probably one of the best ones. Among all the features and functionalities that we have seen, there are many other things that make it quite good. It provides a lot of customization in the form of handlebars, seats and riding styles. For those who want to customize their cycles as per their needs, this is probably the best option for them. It is extremely lightweight and made up of fine aluminum rust free frame which makes it safe as well as durable. We all know how trustworthy the brand Schwinn is in making indoor bikes. They are used in various high end gyms as well as homes to carry out cycling as an exercise indoors. The A.C in the name stands for ‘Authentic Cycling’ which is quite indicative of the actual product. It has a convenient and has a really good 6 magnet resistance system which offers a smooth and realistic experience. This feature makes you feel like you are really riding a bicycle on road. The braking power is evenly distributed and this helps you stop the machine whenever you want to. The price of the machine is something which turns off most people. But if you consider the features and the other aspects of the machine, the price is something which seems quite fair. The bike lacks a computer system to provide you instant data which can be a disappointment for some people. Whether you choose this bike with an original drive or the Carbon blue belt drive, it will give you a good professional feel. It is light weight, made up of good quality materials and showcased in many studios. The price and the computer is a downside, but those who are looking for a good buy, this is certainly the bike you want to buy.